Get 100 percent completion and unlock all endings in The Hostage of Detroit: Become Human. 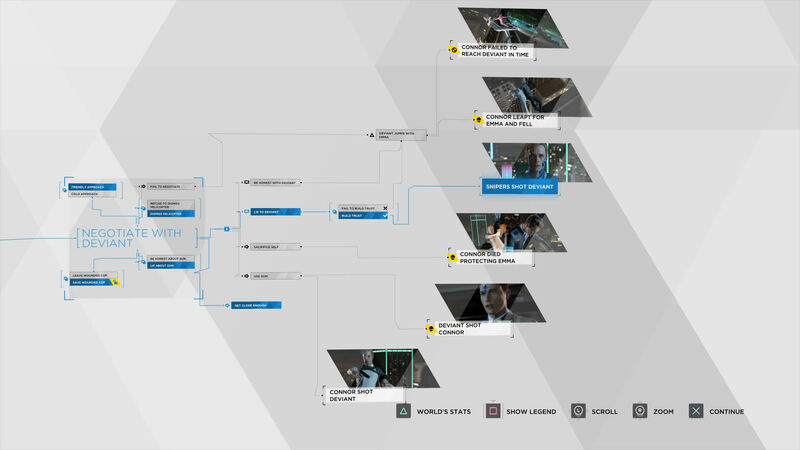 This walkthrough for The Hostage in Detroit: Become Human will earn a 100 percent completion rating while also unlocking all this chapter’s endings. Several runs through this chapter are necessary to unlock everything, but the outcome is largely inconsequential, no matter which ending is achieved. 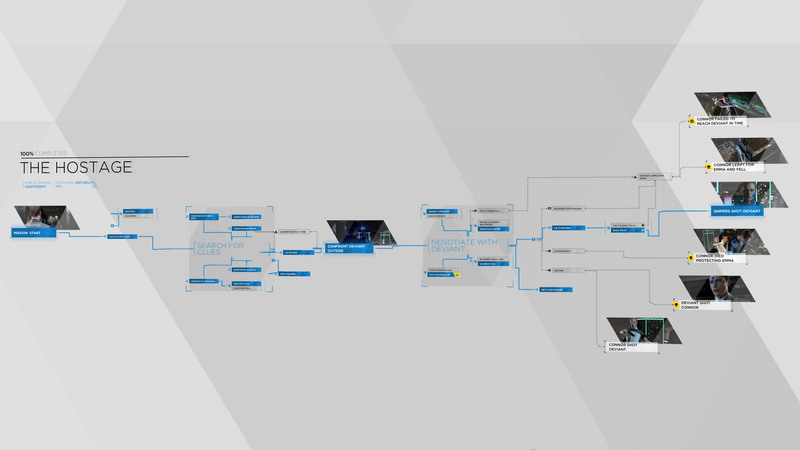 The 100% complete mission flowchart for The Hostage. Players looking to get 100 percent completion in The Hostage will have to seek out a number of different actions and events throughout the course of the chapter. Not all of them can be unlocked at once, so players will eventually need to double back down their path and alter their choices at each decision branch to access different actions and endings. The Negotiate with Deviant flowchart subsection. This ending is possible if Be Honest with Deviant or Fail to Build Trust take place. These two are heavily dependent on the conversational choices made, so gathering lots of evidence before going outside is ideal. Take a sympathetic or understanding approach to avoid this ending and blame Daniel and disagree as often as possible to get it to unlock. Connor will have one last shot to run to Daniel and Emma to try and save her, but if the QTE (quick time event) is missed, this ending will unlock. This ending is unlocked if the Be Honest with Deviant or Fail to Build Trust branches are unlocked. Luckily, if Connor can Get Close Enough (simply walk toward the deviant when outside) during negotiations, he’ll have the chance to run to Emma before she falls. Passing the QTE here is what unlocks this specific ending. This ending is unlocked by raising the mission success meter to 100 percent. Before going outside, going into Emma’s bedroom and unlocking Learn Deviant’s Name is the minimum that must be done to achieve this ending. Once outside, be sure to reassure Daniel and ask him to trust Conner over and over. Dismiss the helicopter when asked. He will release Emma once the meter hits 100 percent and this ending will be unlocked. This is one of the easier endings to unlock. It requires only that Conner Get Close Enough. Once outside, move forward as far as possible until Connor can no longer progress. No matter how negotiations go everything should eventually bottleneck into a single choice where Connor can choose Sacrifice Self. That will unlock this unique ending. Connor must have investigated the dead officer’s body inside and found the gun under the table for this to be possible. Once outside lie about having the gun, then move forward until Connor is as close to Daniel as he can get. When the option comes up, choose to use the gun, but do not shoot. The Intimidate option is best here. Continue to threaten Daniel but never shoot and eventually he’ll shoot Connor. Connor must find the cop’s body inside and construct what happened to find the gun under the table. Take the gun, then lie to Daniel about it while moving forward on the roof until Connor is as close as he can get. Eventually the option will show up to use the gun, take it, but choose to shoot Daniel instead of intimidating him. That will unlock this ending. With The Hostage 100 percent complete and all endings unlocked, players will proceed to the chapter called Opening. For even more choices and endings, check out our Detroit: Become Human 100 percent walkthrough for the best outcomes in each chapter.